Even though the 2013 movie Behind the Candelabra directed by Steven Soderbegh was intentionally a television movie for HBO, I got the chance to go to the premiere in my hometown cinema. I have to say it was definitely worth it and everybody should see it on the big screen. 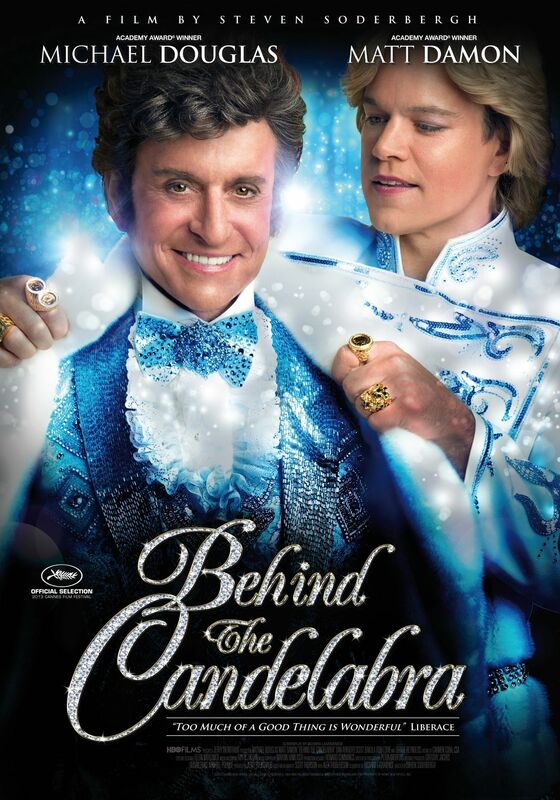 Behind the Candelbra is a drama that shows the last ten years of world-famous pianist Liberace (played by Michael Douglas). Although the story is generally sad, I had a great laugh, which I always enjoy very much since I don’t like stories that drag you down. I just thought it was done brilliantly. You get a close look at Liberace‘s life and you can see what all was necessary to keep up the exuberant look of the lifestyle he showed the public. The story especially focuses on the secret relationship between Liberace and his boy toy Scott Thorson (portrayed by Matt Damon), who wrote the book/memoir that the movie is based on. Both actors have done a marvelous job in making the story feel real, honest and believable. I loved the general storyline and look of the movie and can only recommand it for everyone to see. I am not at all surprised HBO got the highest rating for a TV film since 2004 when the movie debuted. Also, it won several Emmy awards – all indicators for how great it is. Have you seen it? I’d like to hear what you think about it in the comments section below!